Finding a new commercial landscape contractor is a lot like choosing the best college or picking the right babysitter. If you don’t ask the right questions — or enough questions — you can make the wrong decision and end up full of regret. Maybe there’s a reason you’ve been putting off that renewal contract. Property managers in Northern Ohio, are you in the market for a new commercial landscape maintenance contractor? Has your current or last landscape provider given you more headaches and broken promises than attractively installed and maintained landscape beds? Sun to snow, do you consider your current landscaper a single source service provider? From grounds maintenance to snow and ice removal to landscape design and build, it’s important to introduce some consistency to your landscape each and every season. Making sure your next commercial landscape contractor offers a full suite of seasonal services will do just that. Low-emission mowers, smart landscape irrigation and drought tolerant plantings — these are just a few examples of sustainable landscaping you should begin to expect from your commercial landscaper. Anyone can mow and blow, spray some chemicals and call it a day. Companies that proactively implement eco-friendly, cleaner, safer and cost-neutral methods are simultaneously reducing your site’s carbon footprint as well. While safety might not top your list when it comes to what you need from a landscape contractor, it shouldn’t be ignored. Your commercial landscaping company should have workers compensation insurance, general liability insurance, bonded workers and appropriate state licensing. Contractors with liability insurance will cover any property damage or injuries incurred while working on your property. Speaking of liability, property damage and injuries — when employees are on the clock and impaired by drugs and alcohol, there’s a good chance your landscape crew’s professionalism and quality of work will take a significant hit. When you’re vetting potential commercial landscape contractors, make sure they enforce a zero tolerance drug policy to ensure everyone’s well-being. When a company in just about any industry struggles financially, it’s only a matter of time when taking shortcuts becomes the norm. How would you feel if the shortcuts came at your property’s expense? 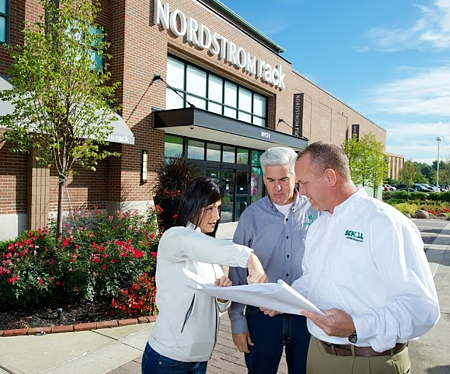 Commercial landscaping companies with good financial footing have better access to quality materials, the newest equipment, a higher caliber labor pool and landscape design capabilities — all of which benefit you in the end. You know what they say: You only get one chance to make a first impression. And that’s why an attractive landscape is so important to you. The same should be said for the appearance of the landscaping company you hire. From the fleet to the uniforms, a tidy and easily identifiable crew is the golden standard and often a direct reflection of your property (and you). When they look sharp, you look sharp and when they look messy, well, you know the rest. Get references. If you’ve ever applied for a job, most employers ask you to submit three references who can vouch for your skills and experience. I encourage you to do the same thing in your search for a new commercial landscaper. Visit the clients of the company you’re considering. Walk around their properties. Ask them direct questions on reliability, conflicts, appearance, quality of work and communication. Will you be assigned a client care specialist? Working with a single, dedicated point person at the company you’ve chosen will make a world of difference when it comes to ensure your goals, needs and budget concerns are heard loud and clear. A dedicated client care specialist will learn all the ins and outs of your property making it easier for them to offer you effective feedback, customized planning and solutions to other landscape hurdles. At Schill, our C.A.R.E. Commitment — Consistency, Accessibility, Reliability, and Expertise — is promised behind everything we do. With proactive solutions like our digital service help desk, our quality audit system, and scheduled service visits, we are able to recognize potential issues with your property and address them before they become costly problems. This is what sets us apart from other commercial landscape contractors in the Cleveland area and throughout Northern Ohio. 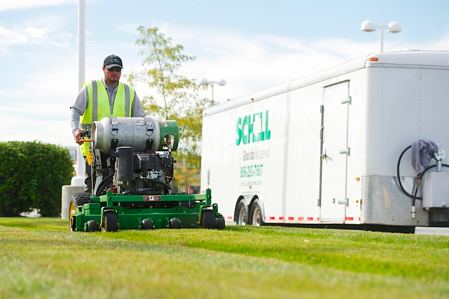 With more than 20 years of commercial landscaping experience, feel confident in letting Schill help you take back control of your landscape in 2015 and give it the attention it deserves. Let’s talk more about how to vet a commercial landscape maintenance contractor, and why managing expectations is critical for a positive experience. Give us a call any time at (440) 327-3030 — or fill out our simple contact form and we’ll get in touch with you!